I have a number of friends who worry about the monopolizing growth of Amazon. Amazon is everywhere. They bought Whole Foods outright for $13.7 billion, and they have bookstores, and they're going to be everywhere. Soon, we're going to live in Prime Houses, working gig jobs on Amazon, all to pay our Prime Mortgage. The reason is simple, Amazon isn't that much of a threat. It really isn't. Like other tech companies, such as, Google, Facebook, and Apple; they seem big, but they're not as powerful when it comes to the other big companies. The secret of all these big tech companies is they talk a big game. They say they're world-changers, they're powerful, they have reach and influence. They say this so people will believe it, so when it comes time to make a decision, the person thinks, "There isn't a decision. It's already been decided by the market." It's the same mentality where Netflix is stocked with thousands of great and interesting titles, but movies like Transformers dominate the watch list. It's easy, it's a known name, and people don't like to take chances. These giant companies rely on these myths so that consumers, workers, and legislators don't have to think or look too deep. Let's look at what happens when these big companies have to deal with real competition. Google Fiber is essentially dead because they're getting sued and out-legislated by the other Internet Service Providers. Facebook continues to grow, but they are quickly running out of ad space to continue said growth, which is why they're going into video. Video, the land controlled by traditional studios, and Netflix, and Amazon Video, and Hulu, and so on, and so forth. Apple is worth a buttload of money, but Android owns the majority of the market in every market. Amazon is no different. They are a bully, in many respects. Bully has a negative connotation, but it's not wholly inaccurate. Amazon decimates markets with few, if any, big players. An important note of that last sentence, I'm referring to multiple big players, not just one. Take for example, the Amazon App Store. Their app store died the day Blackberry couldn't carry its own OS and the Fire phone flopped. I'm sure the Fire line of tablets helps out, but iOS and Android slapped the store so bad that it's not even a concern. Apps I have on Android still receive updates, whereas once they go on the Amazon App Store for the first time; that's it, no more updates. That is, if they show up at all. Even the major apps, like Twitter, haven't been updated in forever. Fun fact, the Fire Twitter app is great and doesn't have any of those stupid recent cosmetic updates. Enjoy it while you can. How about another market? I mentioned the Fire phone. Amazon couldn't hang with any of the big players with their own phone, and a year later, left the space. They have carved out a niche of selling subsidized phones with their lock screen ads. There's always a silver-lining. And another one. 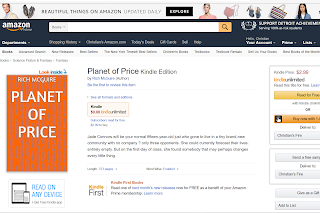 Amazon's competitor to Wattpad was Write On. That was shuttered. Another One. Amazon Register, their answer to Square and PayPal Here. It only worked on a few phones. They provided better rates than the competition, but that wasn't enough to save them. I actually have one gathering dust. Amazon Register was also closed because that card reading business is a tough one. Remember when Amazon wanted to compete with YouTube with Amazon Video Direct? Yeah, that isn't faring too well either. Terrible user-interface with byzantine instructions. It hasn't been killed yet, but do expect it to. There are more if you type in your search engine of choice, "Amazon Failures". You know what I like about Amazon? They (generally) treat failure as a challenge to do better. Good for them. More people should take that approach. The way Amazon managed to get where they are is because they were friendly with their competition. The problem is, the cat is out of the bag. They can't pull the same stunt twice. Everyone sees Amazon as a competitor. Amazon is getting into the grocery business with Whole Foods. Good luck. Whole Foods was already in trouble and looking to get bought out, so I don't see them as a great deal. Every other supermarket is ready to take them on, plus expanding competition from international stores, such as Aldi, and then local supermarkets, and then dollar stores. Their main competition is also Walmart, who very much wants to go pound-for-pound with them. Walmart bought Jet last year for $3.3 BILLION, which was a very costly, and very needed hire. Walmart kept up the best against Prime Day sales. Walmart is also expanding pay and pick-up approaches to more stores. Watch out for them in two or three years when all their expensive warehousing renovation kicks in. Walmart can out-muscle them in cities, but most importantly, in rural towns, where they are felt when they open, and when they close. Whole Foods stores were primarily located in wealthy areas, which means Amazon gets to rural places by mail. You know what's getting better for those rural demographics? Walmart. They have a reach that can't be matched. One last point on the Walmart rivalry. Barnes & Noble recently had an activist investor write an open letter for the bookseller to go private or have a bigger company buy them out. The hope is to take Barnes & Noble out from the stupid world of a public company on Wall Street, that way Barnes & Noble can concentrate on making its business the best it can be. In 2010, Walmart looked at purchasing Barnes & Noble. I have a feeling this will come to pass. Walmart would have an expanded reach in metropolitan areas, where Barnes & Noble holds. A new warehousing system between stores. A significant chunk of ebook retail with Nook, where Walmart can put right on their site, make money on the hardware, and make money on all ebooks sold. Finally, the kicker, Amazon is a U.S.-centric company, with a significant market in the U.K. That's about it. There is an Amazon Canada, but I have friends there who tell me the deals are not like the deals I have. There are Amazon branches everywhere, but they don't have nearly the same market penetration they do in the U.S.. Asia has been lost to Alibaba. Africa is not in play. Nowhere else does Amazon have a hold. And if I were Amazon, I would worry about ever getting the same kind of hold in the EU. The EU just slapped Google with a $2.7 billion fine, which can be described as a warning for further actions. Things look better in the U.S. though. Even with a number of congressmen and senators looking to take Amazon down a peg, I don't think it will have any effect at all. Other countries have big markets with their own big players. There is very little worry about Amazon taking over there. Here, we're going to take a look at one last example of how Amazon can't hang with real competition. Several years ago, Best Buy was in fear of going the way of Circuit City. One of the killing forces on Best Buy were "window shoppers", the kind of people who would come to Best Buy to check out merchandise, and then buy it on Amazon because it was cheaper. Best Buy complained that their higher prices were due to the fact that they can be reached on foot and they train staff. How could they compete with Amazon? Best Buy created a new policy. If they carry a product, and it is shipped and sold from Amazon for a cheaper price, Best Buy would price match it in store. I've personally done this several times with Blu-rays and smaller items. Now, price matching helped, but Best Buy is a retail business. If they are as good as they say, if they can bring people into the store, they can have them leave with one product or more. That's where Gamers Club Unlocked originated. A GCU subscription allows a customer to receive a 20% discount off any new game from Best Buy, which then gives Best Buy points, which gives further discounts, which is further assisted by coupons. I picked up The Witcher 3 new when it had a sale, with 20% off, with a coupon, and paid, like, $26 or something like that. And that was close to launch. The DLC hadn't even hit yet. That got me, and plenty of other people into their stores. The combination of competing directly against Amazon and successful ventures such as GCU revitalized Best Buy. Consumers came back in, because it was convenient to do so. That's why Best Buy stocks are the highest they've ever been! Best Buy adapted, and was rewarded for doing so. Good for Best Buy, but this is about Amazon. Amazon saw just how well GCU was treating Best Buy and wanted to cut that off. Amazon offered their own 20% discount on any new games if the consumer has a Prime subscription. Now, the Prime discount isn't as good as GCU. The discount only applies for the first two weeks of a game's release. And let's be honest, two or three weeks after launch the publisher takes off $10 to $20 for a weekend sale somewhere. But, hey, Amazon competes as well, and all consumers are happy, right? No. Best Buy is winning this fight for video games. Amazon Canada no longer offers the 20% discount anymore. In the U.S., the Prime discount only applies to pre-orders now, following a similar trend that Amazon Canada did. They blinked. Done. This also ties into my previous statement that Amazon is centered around the U.S. and the U.S. only. They just can't hang. The only way to fear Amazon is to buy into their shadow. And I don't. I don't buy into Google's shadow, or Facebook's, or any of them. The easiest thing to do is not use Amazon, and buy from somewhere else. What could be easier?